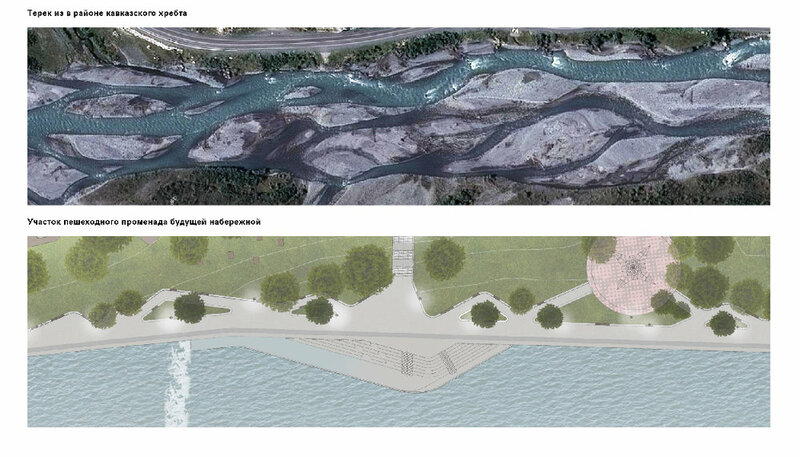 In collaboration with KB "Strelka"
The project comprises a chain of green spaces along the Terek River in the city of Vladikavkaz. Authors have tried to connect them by one general idea, but filling them with various and not repeating program. The project is inspired by the rich culture of Ossetian ornaments and natural shapes of the meandering watercourse of the Terek River. Ornaments seem to be randomly scattered around the park in order to mark important and meaningfull spaces of puplic landscape. In the meanwhile the pedestrian promenade of the embankment imitates the bizarre watercourse of the mountain river with its tortuous forms. 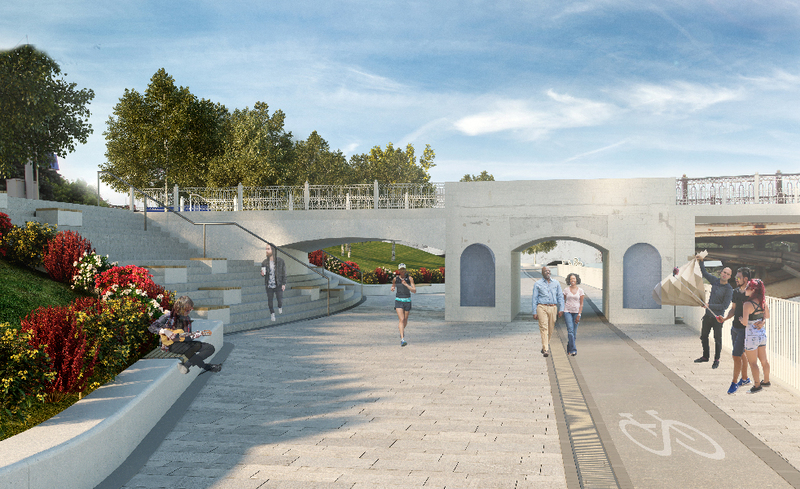 The promenade is possibly expanded in all parts of the park and contains a bikelane and a running track with a special coating. Passages under bridges should be extended as well. The embankment is divided into 5 zones, each with its predominant function: a gastronomic area with restaurants and cafes, an educational area, a central zone for mass events, a family recreation area and a sports area in the end near the Dinamo stadium. A series of street furniture and hardscape elements were designed specially for the city of Vladikavkaz, including benches and urns, fence of the embankment, tree trunks lattice and manhole cover. The design is developed based on the principle of symbiosis of the spirit of modernity and traditions in the shape of national Ossetian ornamental patterns.